Ireland is known for its lush green lands, which are of course excellent for the growing of crops and the grazing of livestock. Traditional Irish food is hearty, wholesome, fare made from local produce - recipes may be simple but they are both tasty and satisfying! Potatoes are also a prominent feature of Irish cooking. They were introduced in the late 17th century, and have become the staple crop of Ireland. Oats and barley are also grown, and have been for many centuries. Popular meats include lamb and pork. Of course, with the island of Ireland being surrounded by sea, fish and seafood is also popular. Ireland is particularly known for its langoustines (known as "Dublin Bay prawns") and oysters, the latter often eaten with Guinness at the many oyster festivals around the country each year. Popular types of fish include salmon and cod. Bacon and cabbage - Irish Americans often make a similar dish from corned beef and cabbage. Champ - Mashed potatoes with chopped spring onions, butter and milk. Coddle - Boiled pork sausages with bacon, potatoes, onions and optionally barley. The ingredients are cooked in the stock that comes from the sausages and bacon. Salt, pepper, and parsley are added for flavor. Colcannon - Mashed potatoes with garlic, cabbage or kale (a type of cabbage closer to the plant's wild origins). Irish stew (Irish Gaelic: Stobhach Gaelach) - A stew made from lamb or mutton, with potatoes, onions and parsley. Barley, carrots, parsnips or turnips may also be added in some variants of the recipes. Irish communities in other countries (such as the United States), have adapted to use locally available meats (for example, substituting beef for lamb), or by adding extra ingredients (such as Guinness or paprika) to create new flavors. 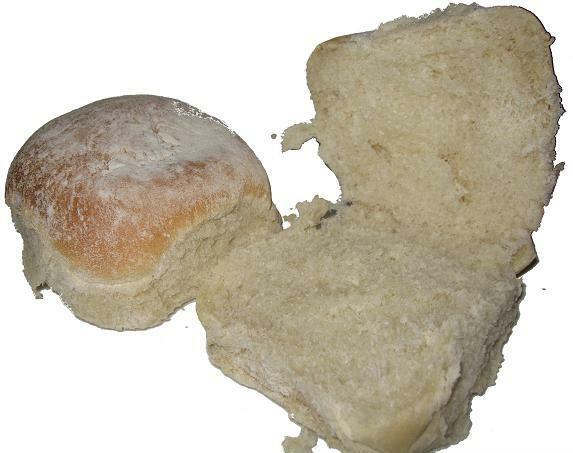 Blaa - A very soft white bread roll, covered in layers of flour, that is unique to Waterford City. Barmbrack (Irish: Báirnín Breac) - This is an Irish sweet bread made with sultanas and raisins embedded in it, and often eaten toasted with butter. On Halloween, it traditionally contains various items baked in the bread, which are used for a fortune-telling game (what you get in your slice, tells your fortune). Irish potato bread (also known as "fadge", "potato cake", "potato farls", "slims" or "tatie bread") - Unleavened bread made from a combination of potatoes and wheat flour. Soda bread - A bread made using baking soda instead of yeast. Whole wheat soda bread is known as "wheaten".